You’re the divine wrath of God himself, Johnny Blaze. Yet you spend all your time cruising around the U.S. of A. Did you really think that was the only country God cared about? Ghost Rider is a strange character. Created in the seventies, he saw his stock take a huge increase in value during the nineties in the era of “darker and edgier” heroes before slowly fading down to relative obscurity. The closest the character has come to mainstream success has been the god-awful Nicolas Cage Ghost Rider film. So, he makes a strange choice to receive a Marvel Omnibus, somewhat comparable to the Omnibus collecting The Immortal Iron Fist a few years back. The prestige format is usually reserved for the best of the best, high profile runs (past and present) on characters of either historical importance or receiving a feature film in the coming year. Jason Aaron is a creator rising in prominence, but it still seems a strange choice to publish his Ghost Rider run in the format. That said, it is perhaps the best run ever written on the character. That is probably, to be honest, a bit of a backhanded compliment. Ghost Rider as comic book character doesn’t have an iconic run or a selection of classic stories for anyone interested. He’s not Spider-Man or Captain America or Daredevil. He’s a dude who rides on a flaming motorcycle with a screaming skull for a head who uses the title “spirit of vengeance” as an excuse to engage in all sorts of vicious behaviour. Every character is somebody’s favourite, so I am undoubtedly being harsh on the character, but I have no emotional attachment coming into the hardcover – which is, to be honest, probably a fairer starting point. Jason Aaron has crafted an epic Ghost Rider story which tells the story of a coup in heaven organised by Zadkiel – who in Christian dogma is the angel of mercy and benevolence. Along the way, he heavily rewrites (or develops, depending on your perspective) the Ghost Rider mythology – expanding it overseas and painting the Ghost Rider as “Heaven’s Black Ops”, a rich line of champions who have dished out hot, steaming plates of vengeance to those deserving. It works well as a roller-coaster adventure – it’s not perfect or brilliant, but it’s smart and witty. As I alluded to above, the best comparison for Aaron’s run is the work that Ed Brubaker and Matt Fraction did on The Immortal Iron Fist – another obscure little character whose continuity got a massive overhaul for an epic story about conflict in heaven. Both runs are collected in the wonderful Omnibus formats and tell relatively self-contained stories which are generally agreed to be the best examples of stories featuring those characters. Both runs do well to remember the roots of the characters while expanding the mythology – Brubaker and Fraction gave us a magical karate epic, while Aaron gives us a bizarre religious Western. At its best, the run is trashy fun. There’s a wicked sense of humour behind it all, and an indication that Aaron isn’t taking it too seriously. This works, because the concept of a guy riding a motorcycle with a flaming skull is one to be handled lightly, and could fall to pieces if it begins to take itself too seriously. There are moments of excess – for example, the Anti-Christ (a demonic pervy little brat) getting a job on Wall Street at “Gourmandize Brothers”, in a reference trying too hard to be relevant – but for the most side Aaron balances it quite well. If you aren’t in the market for zany over-the-top fun, then perhaps you had best look elsewhere – while his initial chapter manage to (just about) keep the lid on, by the time the miniseries Heaven’s on Fire rolls around things have just gone nuts. There are some problems with Aaron’s saga. The first is that it doesn’t feel entire or complete in the same way that, for example, Brubaker and Fraction’s The Immortal Iron Fist does. Specifically, in picking up the volume, it seems like the story is missing a first act. 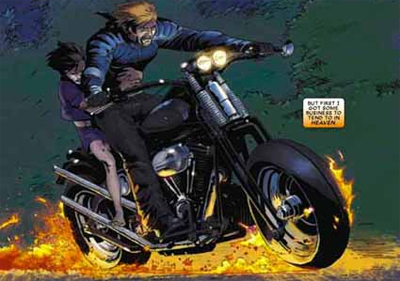 The Omnibus opens with a “Previously…” page, and Johnny Blaze is already familiar with all the key players, having seemingly just returned from an encounter with angel Zadkiel. It’s not that a new reader is ever lost or confused – to Aaron’s credit, he is sure to explicitly offer exposition everything you need to know – rather that it feels we’re joining a story already in motion. What we have is a superb second and third act to this story, but it just seems the introduction is missing. Perhaps part of this is down to the character’s tangled continuity. I won’t pretend that I know Ghost Rider well enough to judge, but it does seem like Aaron knows his material very well and pays due respect to what came before. Unfortunately, it seems that what came before was a bloody mess. Back story is often explicitly handwaved by characters as “a long story”, while at one point Johnny himself concedes his family tree is “one I ain’t even sure I understand.” Aaron frequently brings in obscure second-rate characters to the story that I am not entirely sure need to be there. Most seem to just add clutter, especially to the grand finale of Heaven’s On Fire. Still, that’s a relatively minor complaint, but a distracting one. New characters are always introduced economically and effectively, but older obscure characters are treated as needing no such introduction. Perhaps that is reasonable when we are dealing with a series of comic books, but it doesn’t suit this format at all. That said, there’s some good stuff here. As well as the craziness of gun-totting nurses and “gun nuns”, there’s also an interesting exploration of the religious extremism – handled here through the cult worshipping the angel Zadkiel as he attempts his coup in the Celestial City. Johnny’s brother Danny is a member of the cult, who justifies his murders with the belief that he is “saving” his victims. A prison guard kills two of his colleagues while making the dispassionate observation, “You should’ve come to church with me when I invited you.” It’s cold and terrifying, the lengths to which this sort of extremist will drive people. “It’s people like you that give religion a bad name,” a dying nun remarks to the Deacon, a zealot who kills for Zadkiel. Religion is a tricky subject to handle, especially in a mainstream comic book. Aaron manages the task like Kevin Smith did in Dogma, by being informed enough that he never seems ignorant, and couching his terms in wit. Aaron knows his material very well, and he acknowledges the various schools of belief (noting that the constructs of the eternal afterlife are shaped by one’s perceptions), even as he consistently approaches the idea of God from a Judeo-Christian perspective. I do have to concede, though, I am fascinated to see what a Buddhist “Spirit of Vengeance” looks like. The art varies wildly. I like the work of Roland Boschi, who handles the first arc of the series (Hell-Bent & Heaven Bound) and the concluding six-issue miniseries(Heaven’s on Fire). It reminds me of a slightly rougher John Romita Jr., and the cartoony style suits the material perfectly. Tony Moore does good work on the three issues that bridge from the main title into the miniseries (Trials & Tribulations), but I have to admit I found the shift to and from Tan Eng Huat’s work to be distracting. It isn’t that his artwork is bad (though I prefer the work of the other two artists, to be honest), it’s that it’s so markedly different that it’s strange to change to it and then to change back). Still, it’s a nice little omnibus. It’s certainly not essential, nor is it perfect. It’s solidly entertaining and perhaps the best Ghost Rider run ever. It’s fun and wacky and over-the-top. It’s got great lines and great action and a handful of smart ideas as well. It’s not the best omnibus Marvel have released of late, but it is diverting and engaging.